SFF: How did you first get into weaving? 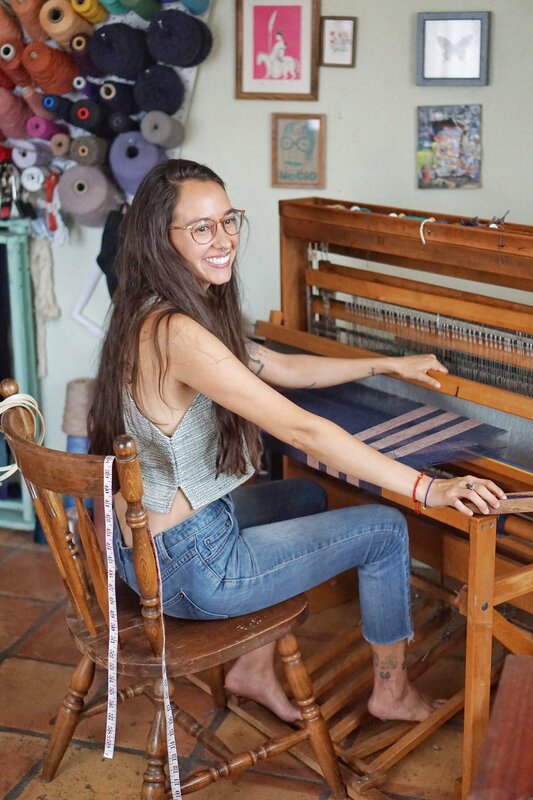 CH: I started weaving in 2015 at the Southwest School of Art in San Antonio, TX. My sister was taking classes there and encouraged me to look through the course catalogue. I saw the courses in the Fiber department and Intro to Weaving sparked my interest, so I enrolled in a class and it completely changed my world. Just going into the weaving department felt like walking into an oasis. The weaving department is huge and beautiful and all of the women, its mostly older women, are so incredibly sweet. It’s as if they’re in a different time frame. It takes a really beautiful patience to be a weaver. Everything takes hours, so people who get into weaving, or anything in the fiber world, are aware of that and are ok with slowing everything down. SFF: Is that something you had to learn to appreciate, or did you already value that before you started weaving? CH: Starting to weave definitely helped me slow down a lot and be more patient. I’m more of a reactor, rather than stopping and thinking about everything. Weaving taught me how to take time and process things before taking actions. I definitely value that. When I’m weaving, it’s like I hop into a different place where time doesn’t really matter. Three hours to me is nothing. SFF: About how long does it take to make one of your pieces? CH: To set up the loom -- just to get all the threads measured and threaded on -- takes about five hours. I’ve been “tying on” the new warp each time which means tying 400 knots. That alone takes at least 2 hours. Weaving the fabric takes between one to three hours per blouse, depending on the style. But it’s an active meditation. There’s a pattern to the process that goes “1, 2, 1, 2” which allows me to tap out mentally. It reminds me a lot of yoga. You know when you’re practicing, and you’re trying to hold a pose, but your mind starts thinking about other stuff and then you fall out of the pose? It’s because you had lost the intention of what you were doing. With weaving, it’s the same thing, where I can let my mind wander just enough, but if I let it go too far then I end up skipping things. So it’s a nice meditative process. SFF: Do you listen to music while you weave? CH: I like listening to groovy music. I’ve been listening to Jamie Isaac. He’s just nice r&b, jazzy music. I like music with not that many vocals. When I’m weaving it’s nice to not have to hear all the voices. SFF: How long have you been in Santa Fe? CH: I got here in the beginning of June. I love it so much. I’ve been visiting Santa Fe for the past two summers. One of my girlfriends, Inge, moved out here a few years ago so I’d come out to visit her. I would always enjoy myself so much out here. Being able to go to Chimayo and seeing the weaving culture on a daily basis and how much more prevalent it is in the culture here in New Mexico is fascinating to me. I was also at a very low commitment place in my life in San Antonio, so I decided to relocate myself this time around. Being in my hometown, it was hard to pay attention to my craft-- I just wanted to hang out with friends. So it’s been a really nice peace of mind being out of San Antonio. SFF: Do you think you’ll stay in Santa Fe? CH: San Antonio will always be my home, and I don’t think that I’ll ever be gone from there forever. My plan moving here to Santa Fe was to give myself six months and then re-evaluate after that. But now I feel like giving myself a year wouldn’t even be enough time to get my feet wet here. It’s been really lovely so far. SFF: Have you ever lived outside of San Antonio before? CH: After college I lived in South Korea for a year teaching ESL. The job itself was really overwhelming. I was teaching little kids, so it drained a lot of my energy. But living in South Korea was amazing. After my teaching contract, I backpacked around Southeast Asia for three months which was a mind-blowing experience. At the end of that trip I spent three weeks in a town in Northern India called Dharamshala, up in the foothills of the Himalayas. I changed my flight back two weeks because I fell in love with the town and felt it wasn’t my time to leave. It’s where the Dalai Lama resides. I got to hear him give a lecture and did a ten day silent meditation stay in those extra couple of weeks. SFF: Do you have a meditation practice daily, outside of weaving? CH: I don’t sit, but I like the Buddhist idea that less is more and that you really can’t take anything physical with you into the next realm. Also, just being good to people and the idea of reincarnation, clearing out knots in your soul for your next life. There are definitely different things from Buddhism that I try to practice on a daily basis. SFF: How did you come up with the name Lil’ Weavy? CH: When I was taking my first weaving course, I was making a sample piece with all these different patterns. Seeing the patterns come out in the fabric was blowing my mind. I was like “Dang, catch me on the loom, call me Lil’ Weavy”. The one of my buddies took a video of me working on the loom and said he was going to put it up on Facebook, and suggested that I come up with a name and make a page for people to follow me. So I decided on Lil’ Weavy. SFF: What are your hopes and dreams for your business? 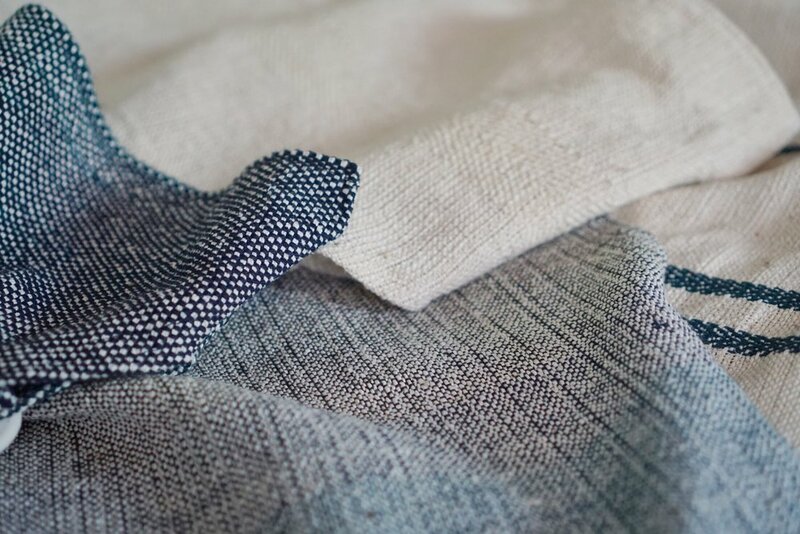 CH: One of my big goals is to make a whole handwoven wardrobe. To have the skillset to be able to make pants, a jacket, all types of clothes, is definitely something I’m working towards. When I first started trying to make a business out of Lil Weavy, a friend that I look up to suggested that I find one thing to really focus on producing, and that has been blouses so far. To see them start as just being thread on a cone, measuring it out into the warp, stretching it on the loom, making the fabric, sewing it into a blouse, and then seeing another body put it on; that’s one of the most gratifying things that I’ve ever been able to experience. Our bodies truly are works of art in themselves and they should be celebrated on a daily basis. It’s really nice to have someone put on one of my handmade garments and see it all come together. A handwoven adoration of the body. SFF: How did you come up with the patterns for the blouses? CH: The very first blouse I made was a poncho style, which was inspired from Mexican ponchos. Then I came up with the boxy style because I wanted to waste as little fabric as possible. The spaghetti straps pattern I came up with myself, gave the pits some breathing room. I really like playing with plain weave and using different colored stripes to add depth to the fabric. Ive also liked the classic look of using a single color for a blouse. A lot of the thread I’ve been using was donated to me. One of my fiber fairy godmothers gave me boxes full of the most beautiful threads in muted palettes and I think that’s definitely directed me in a certain way with colors I choose to use. I’m so happy there was a lot of cotton threads because I’ve really fallen in love with working with that fiber. SFF: Did you already know how to sew, or did you take a course with the weaving courses? CH: I took sewing in high school as an elective. I enjoyed it and felt like i had a knack for it. When I first got to university I wanted to study fashion and took a more intermediate course on clothing design. SFF: I love the look of them all, they’re kind of wabi sabi and raw and beautiful. CH: Yes, exactly! I’m a natural imperfectionist, especially with handmade things. I see it as the artist’s touch, their hand in it all. SFF: Who donated the thread to you? My loom was also given to me. At the end of my first semester of weaving courses, I was wanting to buy a loom. I got an email from a woman named Nancy that said she was looking to donate a loom to someone and heard my name by word of mouth. The loom had been donated to her and she was wanting to pass it along in the same manner. She said she’d love for me to have it if I wanted it. SFF: Wow, that’s so generous. CH: I went and picked it up from her the same day she emailed me. Nancy told me her neighbor gave it to her. Nancy’s neighbor was an older woman who was teaching art at an elementary school, so the loom was at a school for a little while for kids to weave on. It’s been passed down through all these people. It’s so beautiful, and you can feel the energy of all those different weavers still in the loom herself. It was truly a blessing because looms are not cheap. SFF: It seems like the beginning of your weaving journey has been so pleasant with people being really giving and kind towards you. CH: I’ve taken it as my ancestors communicating to me that “yes, you finally found it” and that this is what I should be doing. It’s been really serendipitous with how many blessings I’ve received, to where I couldn’t not weave. I have to be respectful of the blessings as they’re given to me. Just having all those higher powers guiding me has felt amazing. It’s really tapping me into something that’s so much bigger than myself. It’s rooting me down into a place that I never would have thought about. Weaving has been a beautifully grounding experience. There are times that I sit at the loom or I’m doing an embroidery and I get these images that pop up in my mind to translate onto the fabric. After I’m done, I sit and I look at them and I don’t even know where they came from. I’m just on this nice frequency of all my ancestors who are trying to send me messages saying “do this” or “create that”. I’m just trying to pay my respects and keep up with it. I could really weave for the rest of my life and still not even learn everything about it. It’s something I’m really looking forward to. SFF: That’s so beautiful. It’s such a healthy relationship to have with your art. CH: And it’s an ancient art! It’s so old. Every civilization in history has had a weaver of some sort to make clothes for their people, swaddles for the babies, tapestries to keep the living environment warm. It’s been a part of every life so there’s that really beautiful power in it and I want to keep it going, keep it alive. SFF: And have people been receptive to your work? CH: The initial reaction that I got from people in San Antonio was beautiful! Since it’s such an old craft, it’s in a really deep rooted place in everyone’s soul. They see it and they’re interested and wonder how it’s made. Just the handmade fibers i think really piqued interest in a lot of people because there aren’t that many people weaving, especially in our generation. So people were really interested and were super supportive from the beginning, which was so sweet and encouraging to experience. SFF: What is your favorite thing about Santa Fe so far? CH: It’s very inspiring being in Santa Fe because, from what I’ve seen so far, it doesn’t seem like there’s any ugly competition. It’s more like, “You make that and I make this, let’s work together” Even if you’re working in the same medium as someone, people want to be open and sharing, and they try to connect you with as many people as they can. I think it says something really good about this city that there are so many people making and creating full time. Having that support from people who appreciate handmade things, or slower made processes, is really special. There’s also something really special about the land itself here -- something about the energy. People who match the frequency visit Santa Fe and realize they need to come back, and something eventually draws them to return. From just talking to people here, it seems like a lot of people move here for a specific reason, even if they don’t know what it is. They just realize they need to go to Santa Fe and then all these little blessings start going their way. Being here, I’ve been introduced to some of the most beautiful people I’ve ever met. It’s such a big group of like minded and open hearted people. It’s really sweet. SFF: For some people, it can be hard to meet people. But in our experience, when you do, everyone is so nice and so kind. CH: It seems like a place that people come together. Maybe it’s because there are a lot of transplants here, who have all had to go through the process of building up a community and making friends in a new city. i think that’s why everyone is so open. There are so many genuine, real people. I haven’t picked up on any ulterior motives. In other cities, people meet you and wonder what you can do for them. That always throws me off, I don’t know what I can do for you, but let’s just be friends. SFF: I love that approach. Thank you for chatting with us!